What’s on your list of New Years’ Resolutions? Start your own company? Run a marathon? Write a blog? Or maybe just aim for your five-a-day and take a walk rather than running for the bus? Team Most Wanted are jumping on the whole Veganuary bandwagon with some plant-based recipes, naturally paired with our favourite vegan Most Wanted wines (hey we can do vegan, not sure we can do a whole month of no alcohol). It’s been an eye-opener to be honest and some fell at the first hurdle. There were those who spent hours chopping up veg, only to top it with a fried egg. And those who obviously didn’t realise that bacon came from pigs. But, you know, small steps and all that. If you’re already committed to the cause then skip straight to the recipe and check out the full Most Wanted range to see which of our wines are suitable for vegans and vegetarians. Which begs the question, what exactly is a vegan wine? In order to get your wine in the bottle crystal clear, with no dusty bits, winemakers usually add tiny amounts of a fining agent, some of which are made from animal-derived products (including egg white or gelatin). Hence the vegetarian or vegan labelling. So how about forgetting your meat and Malbec fix (at least for the next few weeks). 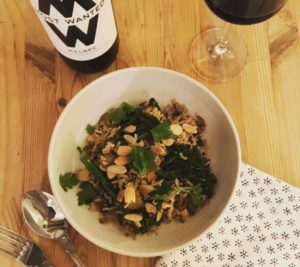 Here’s one of our favourite recipes, a vegan Biryani courtesy of Morrisons recipe pages, paired with SMOOTH/FRUITY Most Wanted Malbec from South Africa. There might not be any meat involved, but there’s enough punchy flavour in the food and wine to help you put those thoughts of chargrilled steak to bed (not literally). Heat the oil and fry the onion over a medium heat for about ten minutes or until golden. Stir in the garlic, ginger and garam masala and cook for about one minute. Add the tenderstem and continue to fry everything for a couple of minutes until the tenderstem is beginning to soften. Stir in the cooked rice, half the almonds and all the sultanas. Season, then increase the heat and stir-fry for a few minutes until the rice is completely heated through. Stir in the yogurt substitute and most of the coriander then spoon onto plates. Scatter over the remaining almonds and coriander, and pour yourself a glass!